The Stardust Mystery book is a companion to The Stardust Mystery game. 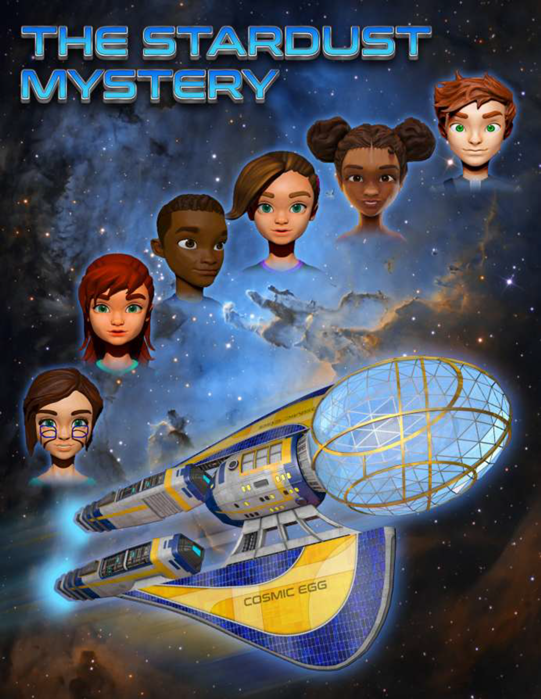 It follows the adventures of Lizzy, Milo, Neddy and VC as they travel the stardust mystery trail in The Cosmic Egg time, space, and dimensional travel machine through the history of the Earth and the Universe. They are finding out what stardust is, how and when it was created, how it got to Albert Einstein and the last T-Rex, and from them to you. The Stardust Mystery will be released alongside the game. They win the regional competition with a virtual reality website called the TheBeamer, in which the kid’s avatars can visit a time and a place (present or past), and talk to historical figures. For example, they visit Pisa in 1600 and talk to Galileo about his experiment. You are made of STARDUST that was once in the body of George Washington. What is STARDUST? Where did it come from? How did it get into George Washington’s body? How did it get from George Washington’s body to yours? These are the things The Space Cadets need to figure out. It is all based on scientific fact. They also visit and talk to important scientists who help them solve the puzzle. The kids compete against 6 other teams in the final. To solve the puzzle, they learn a lot of science: atoms, cells in the body, the universe, nuclear fusion, the big bang and the formation of atoms.